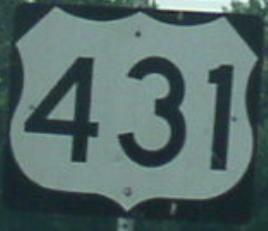 U.S. Federal Route 431 runs north-south through Eastern Alabama. This route tends to be a by-pass for U.S. Rt. 231 in the state. They both enter from Tennessee together, then split at Huntsville. The highways meet again at Dothan. Info on U.S. Rt. 431 is broken down by county below.